In some ways, bottle-feeding is easier on new parents than breast-feeding; you can tell how much formula the baby is taking. Still, you may worry that the amount your baby takes in too little or too much. Babies, like adults, vary in the intake from day to day and even meal to meal. A little variation is no problem. As your baby grows, he increases the amount of formula he takes at each feeding, but he may also eat less frequently. Newborns need around 2.5 ounces of formula per pound of baby weight in a 24-hour period, according to the BabyCenter website. Using this guideline, a 6-pound newborn needs about 15 ounces per day, while a 10-pound bruiser needs about 25 ounces a day. A smaller baby may need to eat more frequently, but even if he sleeps all night, he needs to get the same amount of calories in a 24-hour period. As babies grow, they usually take more formula at a time and eat less often during the day. Most newborns drink 1.5 to 3 ounces every two to three hours, according to the KidsHealth website. The amount of formula a newborn takes generally depends on his weight but it isn't necessary to weigh your baby before each feeding to determine what he needs. Low birth-weight babies may need a higher calorie intake per pound. Your doctor may suggest formulas containing 24 calories per ounce rather than a standard formula with 20 calories per ounce, the University of Washington explains. This increases the calorie intake without increasing the amount the baby drinks, since his stomach may not hold enough to give him the calories he needs. To tell whether your baby is consuming enough formula, watch for signs such as at least six wet and four dirty diapers per day, the KidsHealth website suggests. If your baby acts hungry a very short time after a feeding, she may have a gas bubble or other discomfort rather than hunger. Or she may need a little more formula at each feeding if she's draining the bottle and still acting hungry. 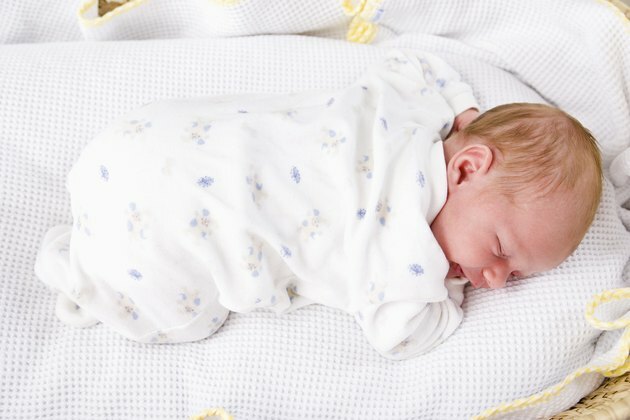 Newborns should gain between 4 and 7 ounces a week for the first month, MayoClinic.com states. Newborns often go through a growth spurt, where they seem hungrier and increase their formula intake, around 7 to 14 days of age and again around 3 to 6 weeks old, according to the KidsHealth website.